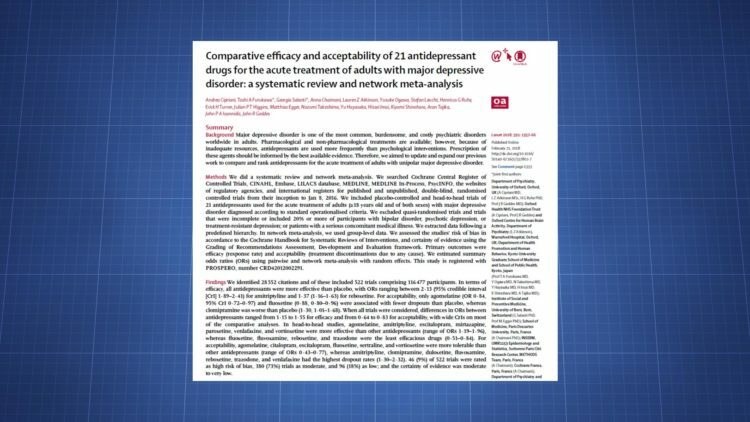 Summary: 522 randomized controlled trials involving 21 antidepressants and 116,477 people were analyzed. It appears the most effective antidepressants (at a duration of 8 weeks) include amitriptyline, escitalopram, mirtazapine, paroxetine, and venlafaxine. While reboxetine and trazodone had notably lower efficacy ratings. Some of the most effective drugs had lower tolerability scores, however, indicating they may have a greater side effect burden. The antidepressant literature shows signs of potential bias, so the results have to be considered with that in mind. The lead author of this paper, Andrea Cipriani, authored a similar paper in 2009. Both utilize a more recent research analysis method called network meta-analysis, which uses modeling to create more drug-vs-drug comparisons. Traditional analyses just focus on the direct comparisons included in trials. Compared to the 2009 paper, this piece was much larger, involving hundreds of additional studies and substantially more patients. It’s the largest research review of its kind. 522 double-blind randomized controlled trials (RCTs) were included. Among those were 421 trials identified via database searches, 86 unpublished studies obtained from pharmaceutical company websites and trial registries, and 15 studies obtained through personal communication or manually searching other reviews. The studies involved 116,477 patients and were published from 1979 to 2016. 87,052 participants were given an active drug, while 29,425 received placebo. On average, the studies included 244 people and they had a median duration of acute treatment of 8 weeks. The participants had moderate-to-severe major depressive disorder (MDD) with mean baseline severity scores (on a depression survey called the HDRS-17) of 25.7 in most of the studies. A major risk of bias came from the funding source for these trials. 78% were funded by pharmaceutical companies. Some of the other trials didn’t report their funding. Because the final treatment response for all participants wasn’t available, the response rate was imputed in 17.7% of cases using a method called LOCF (last observation carried forward). This means the last observed response at an early time point was taken and modeling techniques were used to estimate how the patient would have responded by the end of the trial. These trials were focused on monotherapy (treating patients with a single drug) in adults with a primary diagnosis of MDD. All second-gen antidepressants approved in the US, Europe, or Japan: agomelatine, bupropion, citalopram, desvenlafaxine, duloxetine, escitalopram, fluoxetine, fluvoxamine, levomilnacipran, milnacipran, mirtazapine, paroxetine, reboxetine, sertraline, venlafaxine, vilazodone, and vortioxetine. Two tricyclics: amitriptyline and clomipramine. For primary measures, efficacy was evaluated based on the proportion of patients showing a 50% of greater score reduction at 8 weeks. And acceptability was measured by the total treatment discontinuation rate, encompassing discontinuation for adverse effects, lack of efficacy, and other causes. Some secondary measures were also studied: endpoint depression rating, remission rate, and proportion of patients dropping out early due to adverse events. All antidepressants were more effective than placebo, but with significant variation between drugs. For the acceptability odds, most drugs actually had similar credible intervals, so distinguishing between them is more difficult. There are a few exceptions, like clomipramine, which stands out with its low acceptability score vs. placebo. Compared to other antidepressants, agomelatine, amitriptyline, escitalopram, mirtazapine, paroxetine, venlafaxine, and vortioxetine were more effective, with odds ratios ranging from 1.19 to 1.96. Whereas fluoxetine, fluvoxamine, reboxetine, and trazodone were among the least efficacious, with odds ratios ranging from 0.51 to 0.84. In terms of tolerability, agomelatine, citalopram, escitalopram, fluoxetine, sertraline, and vortioxetine came out ahead (ORs of 0.43 to 0.77). While amitriptyline, clomipramine, duloxetine, fluvoxamine, reboxetine, trazodone, and venlafaxine were the least tolerable (in terms of total dropout rate), with ORs of 1.30 to 2.32. When focused on dropouts due to adverse effects, all active drugs were worse than placebo, which is to be expected. The ORs ranged from 1.64 to 4.44. The results were similar for the secondary outcome measures. The analysis found a few trends that could be indicative of bias. Within the drug-vs-drug comparison, whenever a drug was the novel or experimental substance, it was significantly more effective than when the same drug was the older or control drug of comparison. Once this novelty effect was adjusted for, the apparent differences between antidepressants declined. Smaller and older studies also showed larger effects vs. placebo, particularly for amitriptyline, bupropion, fluoxetine, and reboxetine. 9% of the trials were rated as having a high risk of bias, 73% had a moderate risk, and 18% had a low risk. Industry funding was not substantially associated with differences in efficacy or tolerability measures. Though some studies didn’t report their funding source and the relative of non-industry-funded trials makes it harder to determine the impact of funding on study results. This trial considered more unpublished data than any other, making it a very comprehensive review of the evidence. There are differences between antidepressants, but when all data is considered, those differences usually aren’t massive. And overall, the effect sizes were modest. Because the effect sizes were lower in larger and more recent trials, those studies could be providing a more accurate representation of the true efficacy of antidepressants and the apparent “change” in efficacy over time could indicate the smaller/older trials were biased. It’s possible the use of LOCF to impute missing data altered the results. Because antidepressants usually take weeks to reach their full efficacy, if someone leaves a trial very early, their response at that time point could make an antidepressant seem less effective than it really can be. Evidence-based prescribing is useful, but it’s only as good as the quality of the evidence it relies upon. Hundreds of studies have been done on antidepressants, yet we know there’s frequently a risk of bias and there’s no denying the efficacy/tolerability of some medications has been misrepresented at times. But a review of this magnitude does give a good summary of what we know about the most common antidepressants and it indicates drugs like reboxetine and trazodone should be turned to less frequently than mirtazapine, amitriptyline, paroxetine, and venlafaxine. The most effective drugs tended to be those with a more diverse pharmacology, which fits with evidence showing a very selective focus on serotonin reuptake mechanisms might leave other contributing neurochemical factors unaddressed. Because this review was only looking at 8-week responses, it’s unclear if we can draw truly long-term efficacy and tolerability conclusions. It would be useful to have more long-term data to analyze and it’s worth figuring out how different subtypes of depressed patients respond to different drugs. There’s a lot of diversity among depressed patients, so it’s reasonable to assume certain groups will respond better to different substances.